Back in 1949, the lightest of seven guards who shared most of the action for the University of Miami football team weighed just 188 pounds. But this guard was fast and would hit tremendous lick either with a block or with a tackle as he could and did play both ways. For three years, he was a starter for the Hurricanes- three years in which Miami was ranked among the best football teams in the nation and twice went to Bowl games. Ray came to Miami from Scranton Tech High in Scranton, Pa. He won All-City and All-State honors during high school and was looked on as a potential star from the very start. Everything that happened after that merely made those who predicted a bright future for him look good. "Ray is a senior, 5 feet 11 inches tall, weighing 188 pounds. He is All-America guard material. Arcangeletti is the best all around guard Miami has ever had and ranks among the great guards of the South. He has been a regular from the first day he joined the Hurricane varsity. In high school, Ray made All-City and All-State two years in a row and captained the Scranton Tech team in his senior year." The Ray Arckey period was truly an outstanding era in University of Miami football. Andy Gustafon was coach. 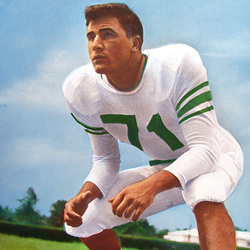 The 1949 team knocked off the ninth ranking football team in the nation, plus Georgia and others to post UM's first winning record in three years. As a Junior, Ray was part of the greatest UM pigskin machines of all time, an eleven which finished as the nation's No. 9 ranking team. It was this '50 team which stunned the football world by upsetting Purdue a week after the Boilermakers had snapped the astounding 37- game winning streak of Notre Dame. When the Hurricanes returned home, 100,000 fans greeted the team at the airport, one of the greatest throngs ever to meet a returning athletic team in the history of sports. That year Miami also defeated Missouri, Florida, Iowa, and Pittsburgh among others to finish undefeated and win a bid to the New Year Orange Bowl Classic. The 1950 UM team was one of only two ever to win nine times for Miami. The 23 victories in three years is the most recorded by any Hurricane football team, so Ray can well be recognized as being a key performer in Miami's glory years of football. Ray and his family now live in Orlando, where he is an executive with a Gypsum firm.